So, remember when you were road tripping, and you just happened across that really cool highway attraction/photo-op? Maybe you turned a corner to find a giant clam in Pismo Beach. Maybe you got to watch that small orange dot way in front of you on the I-5 slowly turn into a sculpture of an orange taller than your car. Or, hey, maybe it's never happened, and you're kind of wishing it had. Great! We've got you covered. No, it's not paper. This concrete sculpture stands outside what was once a paper cup company's building, and for something so large, it sure is inoffensively bland. 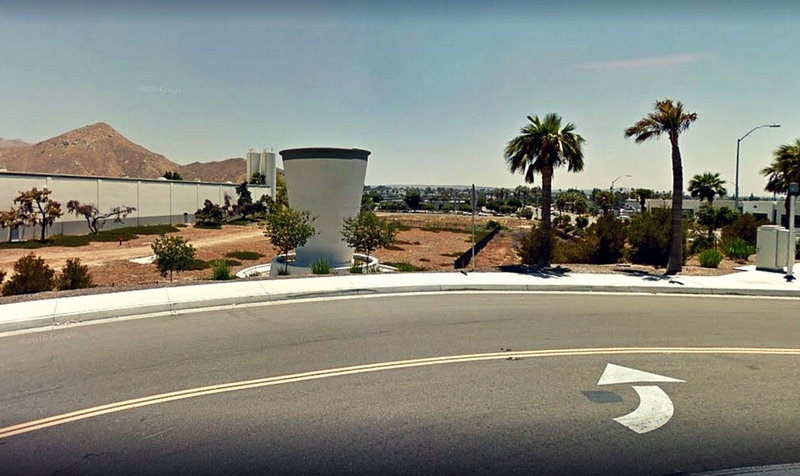 Take a quick detour off of the Riverside Freeway onto East Citrus Street to see it. This one is right off of Golden State Highway, at the Sun-Maid Market. 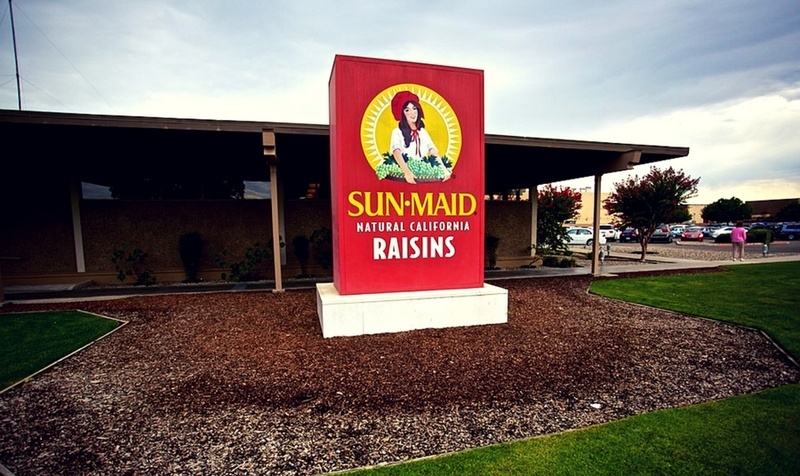 The market mostly sells—you guessed it—raisins and raisin-based food products, plus some cool, offbeat stuff like raisin-themed monopoly. 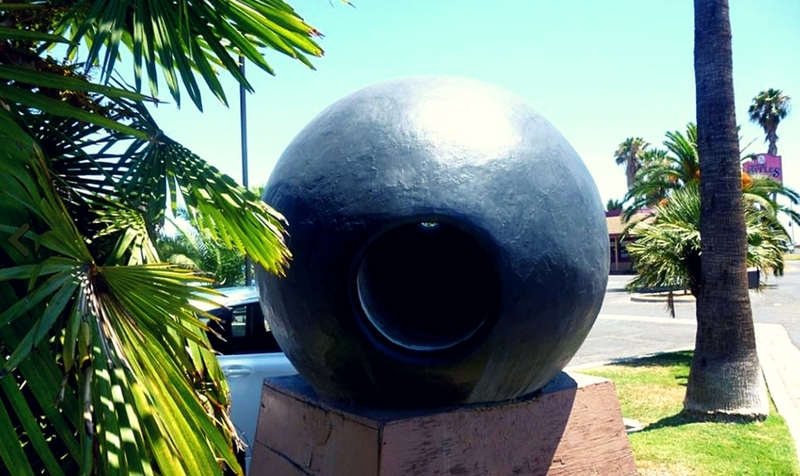 This giant olive stands outside what used to be the Olive Tree Inn in Lindsay, CA. There are conflicting stories about where it used to be before it was moved there—probably a processing plant or a growers' co-op. In any case, it's waiting right off of Highway 65 North for anyone who feels the need to take selfies with it and make jokes about looking for a giant pizza, next. 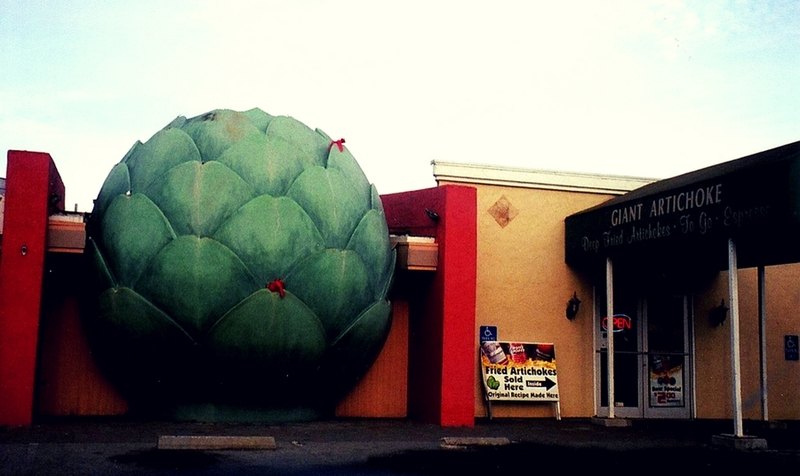 Castroville's giant artichoke is sandwiched innocuously between two buildings in a strip mall just off of the 156. It's... a giant artichoke. Next door is a restaurant that sells deep-fried artichokes, which sounds worth a visit in and of itself. Selfie best captioned with: "Bring butter!" Or perhaps a very tactful choking pun? 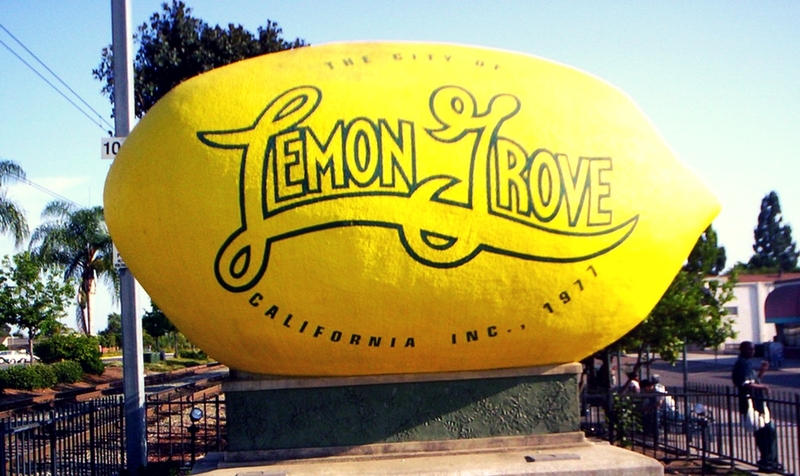 You have to hand it to Lemon Grove. They went bold with this ten-foot-long fiberglass lemon just off of Martin Luther King, Jr. Freeway. Not only is it, you know, a massive fiberglass lemon: its base is inscribed with "THE BEST CLIMATE ON EARTH." That's a type of positivity you can get behind. 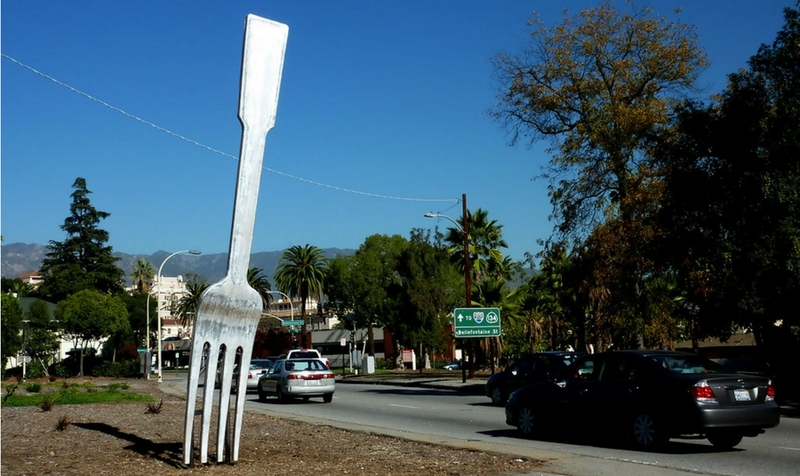 Selfie best captioned with: "When life gives you lemons..."
Selfie best captioned with: Something in the arena of "I'm not a chicken"
The fork in the road in Pasadena, CA is just a 5-minute drive from Historic Route 66 and another 5 from the intersection of the Ventura Freeway and the San Diego Freeway. In 2009, artist Ken Marshall got away with installing it in broad daylight despite having no permission to do so—he simply wore a CalTrans uniform and acted confident about it. 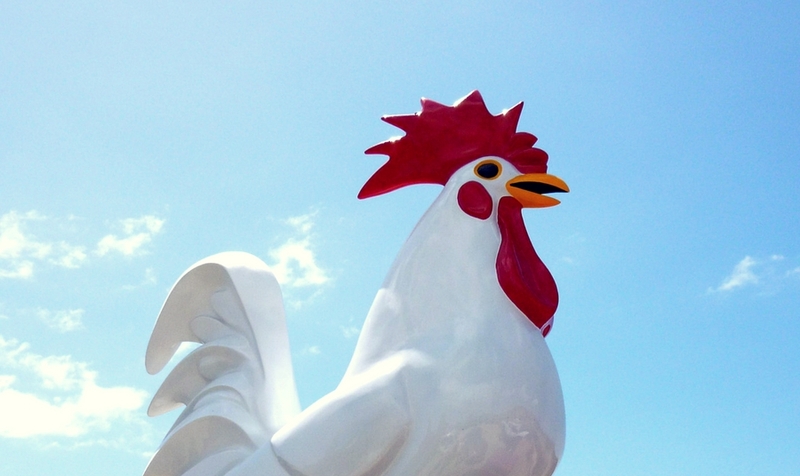 The city took the sculpture down in 2010 and reinstalled it in 2011, after permits were secured. 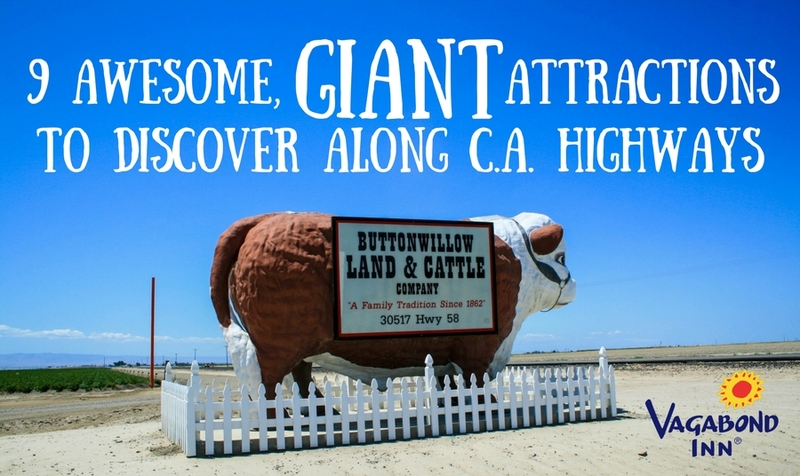 Opening a new location in Buttonwillow, along California's historic I-5, is why we've been thinking about giant highway attractions in the first place. Buttonwillow is best known for its racing park, Buttonwillow Raceway Park. 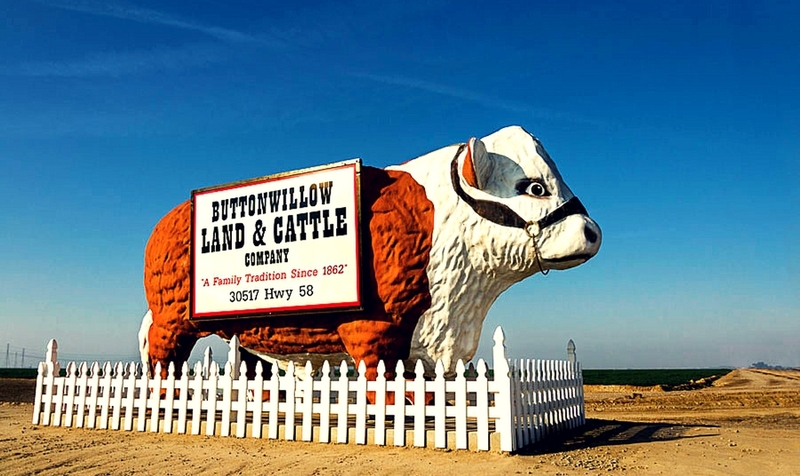 Arguably, though, it's the giant steer of Buttonwillow who offers visitors best photo-op in town. Plus, since it's not located on an island in the middle of a street (looking at you, fork-in-the-road), you'll have ample opportunity to make a fool of yourself trying to get the best possible picture with it. Selfie best captioned with: "Stop steer-ing!"